I find these equal parts hilarious, obnoxious, and oddly compelling. I could wear them both at the same time! At a conference! 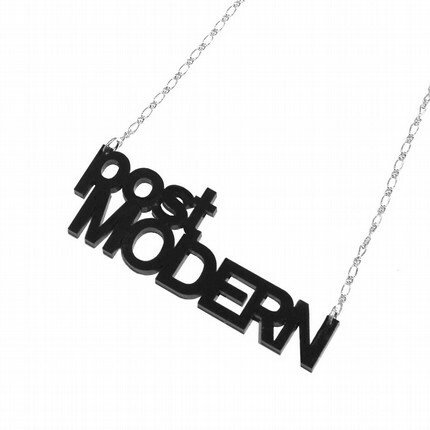 If only they had a “post-futurist” necklace, I’d be set. If only all archaeologists would so kindly wear their theoretical inclinations and aspirations around their necks. What would your necklace say? Hmm? I dunno…do you think “mercenary corporate shill” is too long to fit? Aw, but those aren’t aspirations or inclinations! T-shirt I’ll be making in May? Next Next post: Io Saturnalia!